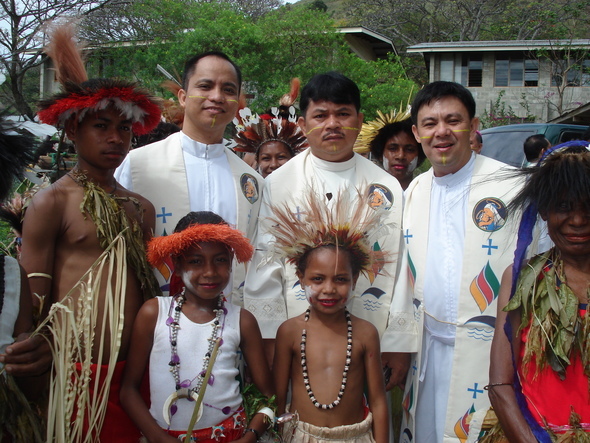 The MSP started its missionary endeavors in Papua New Guinea in 1982 through the pioneering effort of Fr Emilio Soon, particularly in the Diocese of Daru-Kiunga in the Western Province. A year later, Fr Nilo Nemenio joined Fr Soon. When these two priests returned home and subsequently left the Society, a new batch of MSP priests was sent to the diocese. The priests included Frs Alfredo Africa Jr MSP, Edward Edpalina MSP, Reynaldo Getalado MSP, Benedicto Pelias MSP, and Crisalex Concepcion. Seven years later, in May 15, 1989, another MSP mission was opened in the Diocese of Vanimo with the arrival Fr Manuel Jadraque Jr MSP and Fr Jude Thaddeus Besinga MSP. More priests followed and the MSP posts in the Diocese of Vanimo were as follows: Vanimo (Holy Cross Cathedral), Leitre, Utai, and Idam. In July 1989, he MSP extended its missionary apostolate in the Diocese of Kerema and in the Archdiocese of Port Moresby. The first batch of MSP priests who went to Kerema included Frs Wilfredo Borces MSP, Catalino Miranda MSP and Benito Sagra. The last batch included Frs Mario Tejada MSP, Restituto Quintillano MSP and Medallo Valmores (an Associate Member from the Archdiocese of Cagayan de oro). Meanwhile, the first parishes taken by the MSP in the Archdiocese of Port Moresby were in Cape Rodney, Kupiano, and Boregaina. The last addition was the Sacred Heart Parish in Hohola. The first batch of MSP priests sent to the Archdiocese of Port Moresby were Frs Pedro Mesiona MSP, Julian Amamangpang MSP, Fred Homedia MSP, and Edwin de la Pena MSP (he is the present bishop of the Prelature of Marawi). The Hohola house now serves as the MSP District House. In June 2000, the MSP took the Mary Queen of the Pacific Parish in Waigani. Fr Eladio Oliver MSP was the first parish priest assigned there. The Waigani house eventually became the Regional House of the MSP. In 2005, a new mission was opened in the Diocese of Bougainville. Fr Reynaldo Getalado MSP was the first missionary sent to that once war-torn island. A year later he was joined by Fr Ernesto Ablaza MSP. Both work in the two parishes located in the tiny island of Nissan. At present (2010) the MSP missionaries working in the Land of the Unexpected are: Frs Kent Reynold Cue MSP, Eliseo Sangco MSP, Mario Espanio (an Associate from the Diocese Surigao), Guillermo Tadena MSP, Romando Canao (an Associate from the Apos. Vicariate of Bontoc-Lagawe), Reynaldo Getalado MSP and Robert Saballo MSP. The PNG Region used to include the MSP missions in the Solomon Islands. The first MSP mission opened in these islands was in the Diocese of Honiara. Serving in the said diocese were Fr Eduardo Orilla and Fr Jimmy Afable, (an Associate from the Archdiocese of Davao, and the present bishop of the Diocese of Digos). In 1996, the MSP moved to the Diocese of Auki in Malaita. The first MSP missionaries sent there were Fr Benito Sagra, Fr Edgar Labagala (an Associate from the Archdiocese of Davao) and Fr Cipriano Labagala (an Associate from the Archdiocese of Caceres). Other missionaries who worked there were Fr Alvin Parantar and Fr Teodorico Tacaisan Jr. In 2004, the MSP closed its mission in the Diocese of Auki. The last MSP missionaries in the island were Fr Nilo Resco MSP and Fr Noel Suarez, an Associate from the Diocese of Malaybalay.